A night out with friends? A New Years’ party? An office celebration which ran late? We’ve all been there and (over)done that and woken up with that thought, “never am I drinking again” (whether one adheres to this post drunken night thought is a different story). So here it is, your hangover guide. What exactly is a hangover and why are some people more affected than others (yes, as always, there is a scientific reason), TNM brings you your all-in-all hangover how-to guide. The medical term for a hangover is ‘veisalgia’ which comes from the Norwegian term kveis (meaning the “uneasiness that follows debauchery”) and the Greek word ‘algia’ which means pain. While there have been several studies done to determine exactly what causes a hangover, it still remains much debated. Before understanding what causes a hangover, however, it’s helpful to understand how alcohol is broken down in the body. When you consume alcohol, around 25% of it is directly absorbed from the stomach and into the bloodstream directly. The rest of it is absorbed in the small intestine. The rate at which alcohol is absorbed into the body is dependent on a few different things. If the concentration of alcohol is high in the drink, it will generally be absorbed faster. This is why alcohol shots cause people to get intoxicated quickly, while a cocktail might take a longer time to have the same effect. Carbonated drinks, such as sparkling wine and champagne, also have been known to be absorbed more quickly. Lastly, drinking on an empty stomach will also result in a more rapid rate of alcohol absorption into the bloodstream, as food reduces the rate of alcohol absorption from the stomach. Most of the alcohol that is ingested is broken down by the liver. It takes about one hour for the liver to process 10 grams of alcohol, so if you drink alcohol at a faster rate than your body processes it, your resulting blood alcohol level will be quite high. One of two pathways can take place in the liver which result in the alcohol being broken down. In the first, an enzyme known as alcohol dehydrogenase (ADH) breaks down the alcohol into acetaldehyde and aldehyde dehydrogenase (ALDH). ALDH is further broken down into an acetate which is then expelled from the body. On the other hand, when the blood alcohol level is extremely high, another set of enzymes found in the liver trigger what is known as the ‘microsomal ethanol-oxidising system,’ which is usually a secondary pathway but in chronic drinkers this pathway may also be as active as the first. So what exactly about this causes my hangover? Though there has yet to be a definite reason behind developing a hangover, the most commonly accepted explanation for hangovers has to do with the presence of acetaldehyde. As seen earlier, acetaldehyde is the byproduct produced when alcohol is broken down in the body. When it accumulates following excess intake of alcohol, it is thought to result in the symptoms associated with a hangover. Scientists have found that in controlled studies, excess acetaldehyde causes sweating, skin flushing, nausea and vomiting, in other words, the symptoms which are seen in hangovers. Another widely accepted theory has to do with the way the immune system responds to the alcohol. Studies show that there is a correlation between increased cytokine molecules in the body and hangover symptoms. Cytokines are secreted by the cells of the immune system as part of certain normal physiological processes in the body. Scientists believe that an increased intake of alcohol may lead to spike in cytokine release which may lead to headache, nausea, muscle pain (myalgia), as well as irritation. So why does my friend NEVER get a hangover and what can I do about mine? We all know at least one person who seems immune to hangovers, regardless of how much they drink. There have been a few studies which give a scientific reason behind this. Alcohol dehydrogenases are a group of enzymes present in humans which helps break down alcohol into acetaldehyde. It has been noted that some people have a mutation in their genes which results in a delay in the buildup of acetaldehyde, and thereby keeping the effects of the same at bay. Other studies suggest that people in a younger age group are less likely to develop hangovers. But there’s no need to be too envious. While there is no “cure” for a hangover, scientists have found that a few measures can be taken to reduce the symptoms of a hangover. Drinking water in between drinks, spacing out drinks, eating prior to drinking, all help slow the rate at which the alcohol will be absorbed, and will help prevent the symptoms of a hangover. 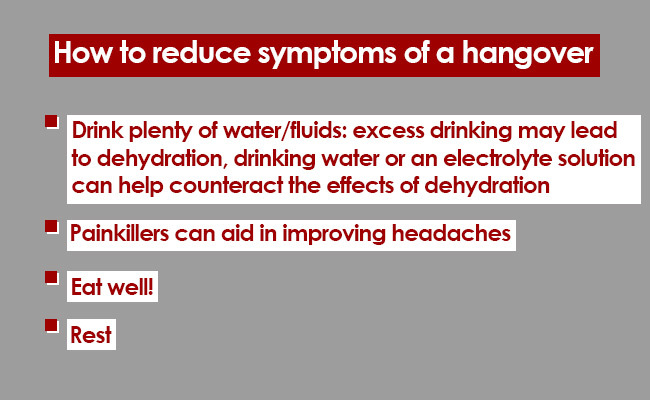 After a night of drinking, if you do find yourself with a horrible hangover, there are a few things which you can do to help reduce the symptoms of the same. First, excess drinking may lead to dehydration, so taking plenty of fluids and even electrolyte solution has been found to beneficial. Further, taking a painkiller can help keep the headache at bay. New Discovery: Dinosaurs May Have Lived Alongside Humans! Saturn is Losing Its Rings!